As a way to give back to their loyal hotel guests while naturally boosting the health and wellness of the local Mojave Desert community, Aqua Soleil Natural Warm Mineral Springs Water Resort and Spa of Southern California is offering daily yoga classes for overnight guests and local Desert Hot Springs area residents. Classes are included free of charge for all Aqua Soleil Hotel guests (and just $10 USD walk-in rates for non-hotel guests) and will be held daily Monday through Saturday at 8AM Pacific Time Zone (PT). All experience levels welcome from first-time yoga beginners to intermediate and advanced level practitioners. Sign up for class at Aqua Soleil now. When would you like to take class? Thank you for signup up for yoga class at Aqua Soleil Hotel in Desert Hot Springs! Please be on the lookout for a reply shortly. In addition to their welcoming space for yoga practice, the Aqua Soleil Hotel & Mineral Water Spa property features two hot tubs and one pool along with an on-site, massage spa; a spacious lounge area; an outdoor fire-pit with ample seating; a connected restaurant serving coffee, tea, breakfast, lunch and dinner menu choices; free parking; and a centralized location that’s just miles away from popular travel attractions like Joshua Tree National Park, Palm Springs and other neighboring Coachella Valley towns. 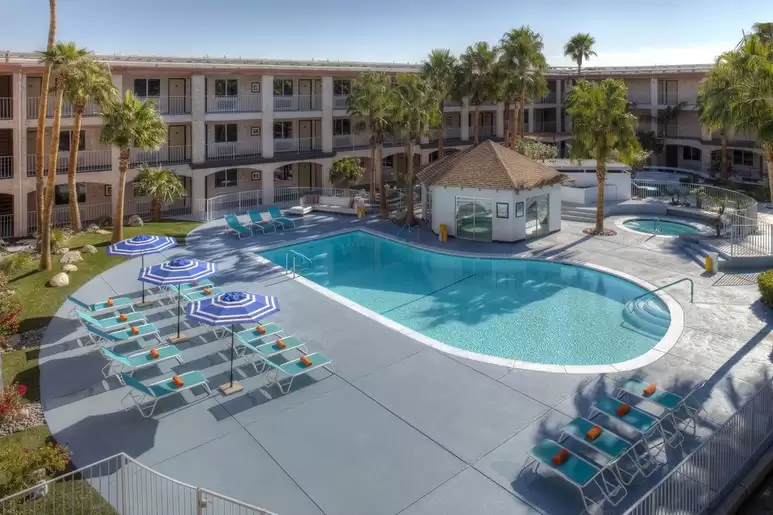 See more at aquasoleilhotel.com and enjoy 10% OFF hotel bookings with coupon code YOGA (Book directly online here or call hotel front desk via 760-329-4481 and mention coupon code*). The daily yoga classes will consist of classic Hatha postures with potential for varying (Vinyasa Flow) asanas all designed to energize, rejuvenate and even trim up the waist line. Have questions about the yoga classes being offered at Aqua Soleil Hotel in Desert Hot Springs? Send a message with any and all questions that you may have regarding these yoga classes. Thank you for your questions about the yoga classes being offered at Aqua Soleil Hotel in Desert Hot Springs. Please be on the lookout for a reply shortly. *YOGA coupon code valid for all Monday through Saturday hotel stays between September 3, 2018 and September 29, 2018 (not valid for stays on Sunday's). Success, you're now signed up for updates!